In chapter twenty of John’s gospel we learn that Mary Magdalene, having encountered two angels in the empty sepulchre where Jesus had lain, turns around and sees a figure whom she presumes to be the gardener. From these brief details of scripture we can picture the entire setting: We are told that Mary does not actually enter the sepulchre but merely looks through the entranceway from which the great stone has now been rolled aside. And we also are told that the figure is a gardener: the sepulchre must be set in its own garden, which is what we would expect of a tomb owned by someone as wealthy as Joseph of Arimathea. 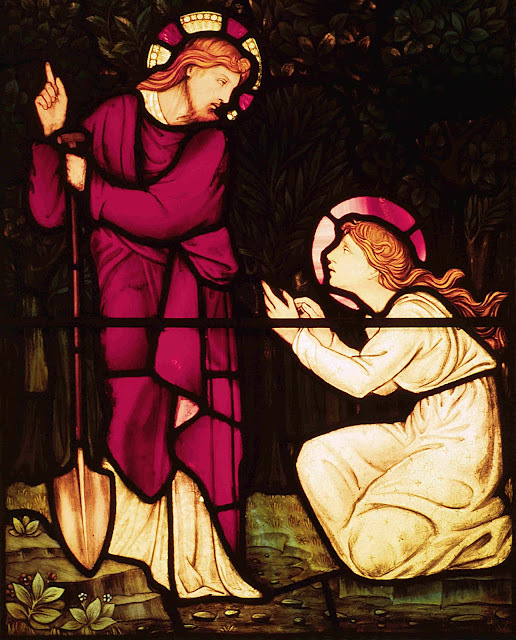 The ‘gardener’, as Mary realizes, is the risen Jesus. “Touch me not” Jesus cautions her, for he is in a state between realms, halfway between the physical world and the realm of the spirit. These few brief verses give us no indication as to Mary’s emotions. We are merely told in that moment of recognition that she addresses Jesus as ‘Rabboni’ or Master. But we readily can imagine how Mary must have been overwhelmed with astonished joy! So here is Mary, poised at the entrance of the tomb, poised between the world of material life and the world of the spirit, and here is Jesus, also poised between those two same realms. They are both in a state of awakening. Through her life’s contact with her spiritual master, this is Mary’s moment: the essential transition between the teachings of the way of the spirit and the actuality of the spirit’s presence and the conquest of death itself. And this also is Jesus’ moment: his farewell appearance both to Mary and a little later to his disciples in his material form before he becomes Spirit forever. But why would Jesus choose the form of a gardener? Great happenings tend to move in great cycles, and this is visualised by the image of the Ouroboros – the serpent holding its own tail in its mouth. So let us follow that image back to another serpent – or perhaps it is merely the same serpent in another guise. We are in Eden. Adam the gardener tends his garden: we even refer to this place as the Garden of Eden. And at the centre of this garden is the Tree of the knowledge of Good and Evil, which we know is really the tree of mortality, of the death of the physical body, should its fruit be eaten. Adam and Eve inevitably eat of the fruit and so lose their immortality, and must incarnate into the material world, with death waiting at the end in the hard world beyond the garden’s walls. But the second gardener in the book of John is the mirror of these events in the book of Genesis. Adam the gardener of Eden was in transition from the spiritual to the physical. Jesus the ‘Gardener’ is in transition from the physical to the spiritual. What now lies before Mary is a task in the world, of living out the ultimate lesson of the spirit which she now has witnessed and learned in that far-off garden by the sepulchre. Her master awaits an even more profound awakening in the realm of the spirit, but for Mary it is the message of the joy of life that conquers death which lies on her lips now. What a remarkable insight this passage offers. The text of John is so specific about Jesus taking the form of a gardener, and this must have a further meaning. Whatever one's beliefs, this passage allows us to glimpse the great cycles of time lying behind these ancient texts. Powerful and insightful ..and so profound....always shining with deep wisdom and light. So beautifully expressed and written..and the stained glass art is so gorgeous.Magical post...thanks for sharing your beautiful world.